The load shifted and liquid was leaking through the floor. A2Z received a call approximately 9:00pm from Landstar Trucking stating that liquid was leaking from a box trailer at the Jessup Truck Stop, in Jessup, Maryland. A six man crew was dispatched to assess the situation and begin the clean-up process. When the crew arrived they were confronted with a 48‟ box trailer with liquid dripping through the floor and from under the rear door. 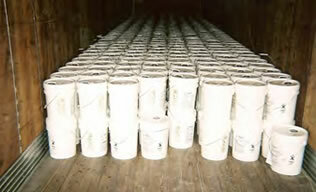 The shipment was approximately 354 five gallon buckets of professional dry cleaning fluid. The load had shifted while being transported and some of the dry cleaning fluid was leaking out. The odor was strong enough to warrant level "B" supplied air respirators. Poly sheeting was spread out in a clear area for placement and inspection of each 5 gallon bucket of dry cleaning fluid. The buckets, one at a time, were removed from the trailer and inspected for damage. Level "B" supplied air respirators were required. Each bucket was then cleaned and placed on the poly sheeting, for safe keeping, until they could be reloaded into the trailer. 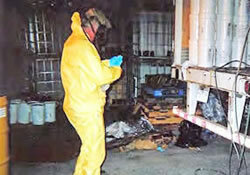 As floor was exposed, the area was mopped with soap and water to decontaminate the trailer. Only two buckets leaked. 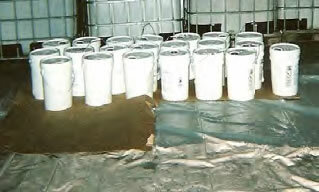 They were placed in drums and sealed for disposal. The underside of the trailer was cleaned where the fluid leaked through. When the cargo was completely unloaded, the trailer was again mopped with soapy water and allowed to dry. 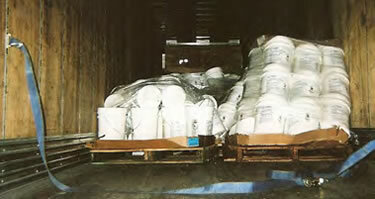 Under the Landstar driver‟s supervision, the trailer was then reloaded with the buckets. This time the buckets of dry cleaning fluid were loaded with a much lower center of gravity, so the load was less apt to move. When the driver was satisfied with the clean up and reloading, all equipment was removed, the area policed and debris was taken away for disposal. The buckets were stacked on poly sheeting. Cleaned, reloaded and ready to go.